What does your company do? Charlie's Drain Service specializes in unclogging drains and offers 24/7 drain cleaning service for both residential and commercial properties. If you are looking for plumbing services, we are happy to refer you to a plumber in your area. Please call 330-678-1252 for a referral. When are you available for service? Business hours are from 8 a.m. to 4 p.m. every day. However, Charlie’s Drain Service technicians are on call for emergency services twenty-four hours a day, 7 days a week, including all major holidays. How much does it cost for a drain cleaning service? A standard drain cleaning call is $125 for the first hour. If there are any additional needs or services necessary to finish the job, a Charlie’s Drain Service technician will update you on the price before proceeding. What payment methods are accepted? For your convenience, we accept Discover, MasterCard and Visa. We also accept cash and checks made payable to Charlie's Drain Service. Are your services environmentally safe? Yes, all materials used are environmentally safe and pet friendly. Charlie’s Drain Service is, and has always been, a green company. Do you service my area? Charlie’s Drain Service technicians routinely service Summit, Stark, and Portage counties. We will also travel to surrounding counties including Cuyahoga, Medina, and Geauga if time permits. 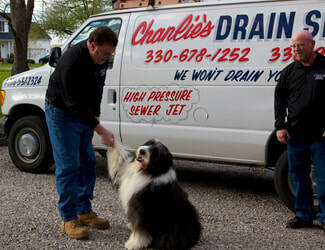 To confirm if Charlie’s Drain Service can provide service to your home or business, please call 330-678-1252. What usually causes a clogged sewer line? A number of items can cause improper draining throughout the sewer system. Items may include broken pipes, debris, tree roots, toilet paper, feminine hygiene products, and many more. What does it mean when I hear a gurgling in my drain? If you are hearing a gurgling in your drain, it means you have either a partially clogged drain or a drain is getting ready to clog. An example of when you may hear a gurgle includes if you flush a toilet and your kitchen sink or bathtub train gurgles. What makes a clogged drain an emergency? An emergency call generally consists of extreme situations or conditions including standing water or sewage in your basement, overflowing drains that won’t stop, clogged toilets when there is only one toilet available, or a drain clog that can prevent a business from operating normally.